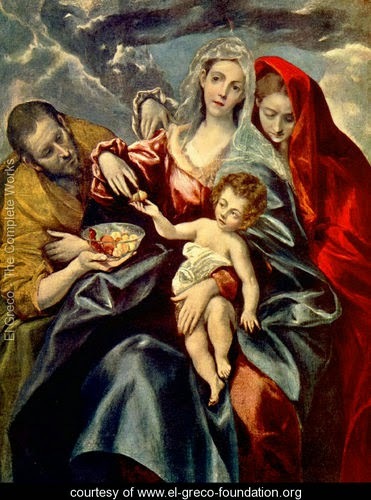 I have long loved St. Anne and Joachim, but they will now forever hold a special place in my heart since my little Maria was born on their feastday. 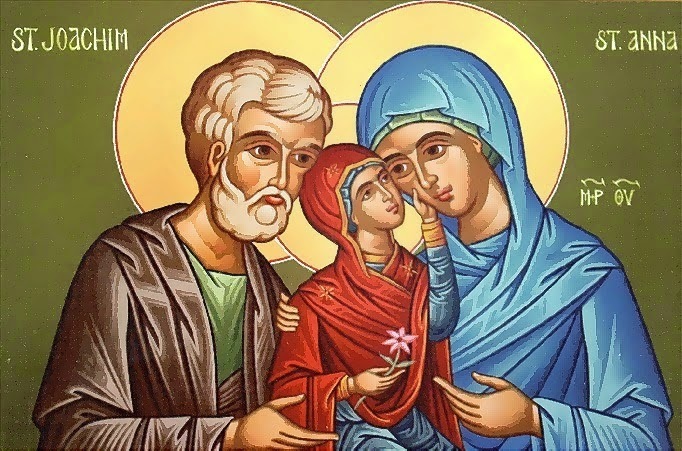 St. Anne and Joachim are the patron saints of grandparents, and St. Anne is the patron saint of women in labor (which gave me so much peace, when I was delivering a baby in the wee early morning hours of her feastday!). To help you get to know these dear friends of mine better, I'd like to share with you my five favorite things about about this dynamic duo. They were a normal married couple. 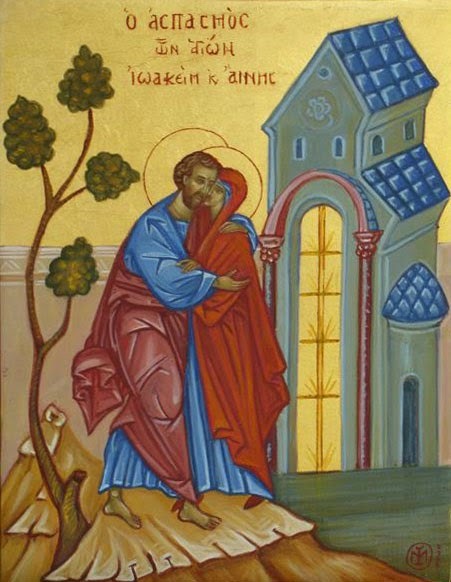 So, this icon is supposed to be a "holy embrace" between Anne and Joachim. The story goes that Anne and Joachim (who had suffered many, many years of infertility) were praying for a child. Joachim went out into the wilderness to pray. While he was gone, both he and Anne were visited by an angel who told them that they were going to have a baby. Joachim rushed home, Anne rushed to the gate to meet him, and there they embraced. Only, this icon is sometimes thought of as not just being them embracing, but them embracing, if you catch my drift. This tender embrace is meant to remind us that, although Mary was given the gift of being conceived without original sin, she was conceived in the normal way. These two loved each other, and out of their real, physical love, a child was born. A beautiful little girl, who's fiat changed the course of salvation history. They just had one little girl. They were parents to a daughter. I have yet to experience parenting a son, but Andrew and I are getting a lot of practice in the art of raising little girls. Little girls are so fun - chatty beyond belief, and affectionate beyond measure. I love the above icon - the image of little Mary snuggling with her Mommy and Daddy. She was a little girl, just like my little girls (only much better behaved!). She snuggled like a little girl, she was in tune with feelings like a little girl, and she probably was as chatty as my little girls. And Anne and Joachim - they knew all the ups and downs of a little girl. They knew how a daughter tugs at your heartstrings and baffles you all at once. And I love them for that! They were willing to "let go." Would you just look at that bitty little girl? 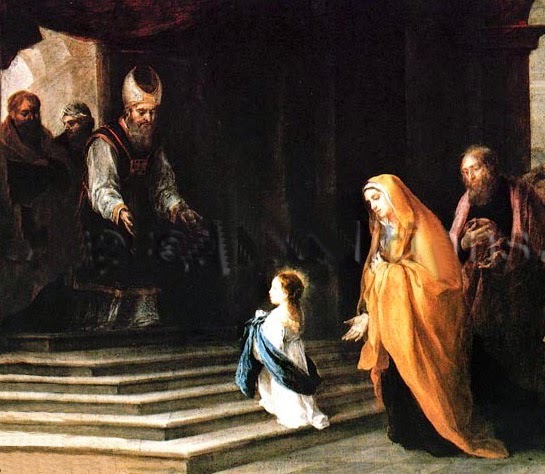 Another part of pious tradition says that when Mary was very small, her parents presented her to be raised in the temple. I remember that really hitting me when Therese was just about the same age Mary was. Therese's baptism anniversary is the feast of the Presentation of Mary, and she and I went to Mass together on that day. During Mass, I was looking at her and realizing - Mary was the same age as my precious little girl when her parents presented her back to God. That must have been so hard. It made my heart ache, just thinking about it. But that is our vocation as parents, isn't it? We're called to love our children and ultimately to give them to God, and to support them in their vocations. I find such comfort in knowing that these two know what that feels like, and are happy to pray for me as I learn to do the same. Grandma can't take her eyes off that cutie! 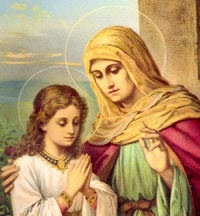 I just love St. Anne and Joachim...they seem so normal compared to a lot of the other saints...you know? I mean they had Mary, but their relationship with each other and devotion seem so much more attainable to me than a lot of the other saints.